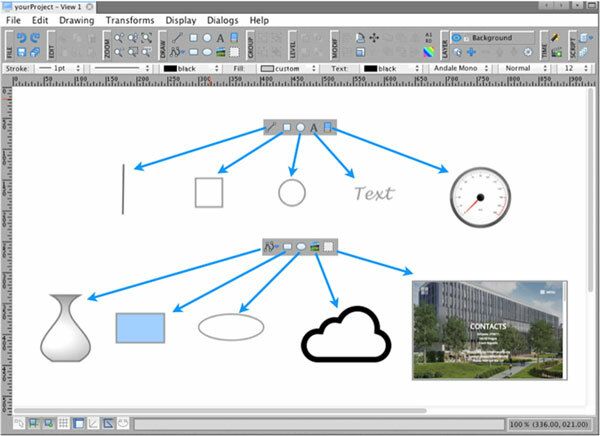 In the DRAW section of the GUI toolbar, you can choose the type of object you want to draw (line, polyline, square, rectangle, circle, ellipse, text) or insert an active area window, picture, or ready-made components. To create a rectangles or squares, click on the Create Rectangle icon in the GUI toolbar (you can also find it in the menu under Drawing). Click on the canvas, hold, and drag the mouse to get the desired shape and size. To create ellipses or circles, click on the Create Ellipse icon in the GUI toolbar (you can also find it in the menu under Drawing). Click on the canvas, hold, and drag the mouse to get the desired size and shape of the object.